If your using/losing 4 quarts in a week, I doubt it's going through the CDR. Any smoke? Is your tailpipe oily? There is ALWAYS oil sitting in the turbo intake flex coupling on any diesel, it has nothing to do whether they have a CDR or not. The CDR is just an open vent to allow crankcase fumes (blowby) to enter the intake air stream. It's always open during normal engine operation so it's rather impossible for them to go "bad" as you read on some sites. 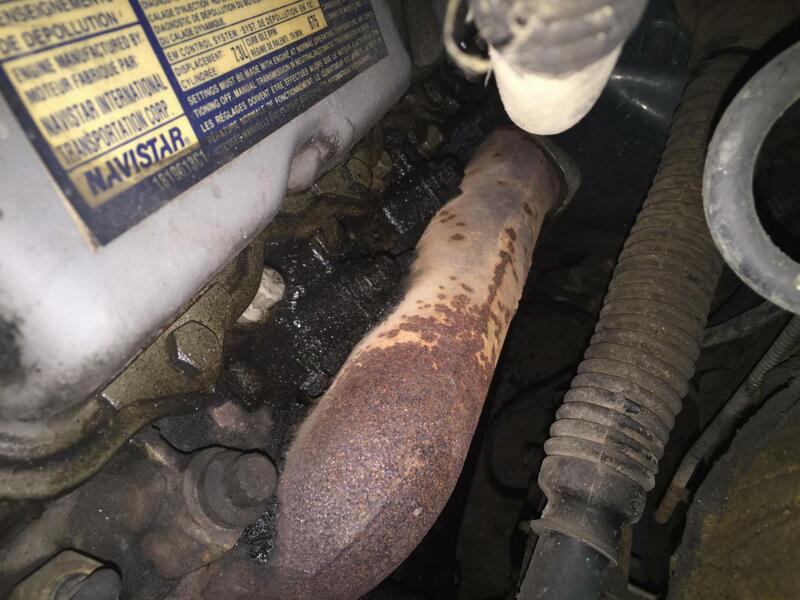 The first thing to check would be for excessive blowby which is most always the cause of excessive oil consumption, other than a significant leak. If you took your pickup into an IH (Navistar) truck dealership with an oil consumption complaint, they have a long diagnosis checklist to go down. First on the list is check amount of blowby and nowhere is a CDR even mentioned. Last edited by LMJD; 04-11-2016 at 10:18 AM. odds are leaking valve cover gaskets! for the oil around the head area, Oil in coolant or the revers would be an indicator of a head issue far as leakage goes, As said check blow by, do a compression leak down test to look for weak rings to see if it is burning it. A leakdown test isn't the greatest for checking rings, scored cyl. wall, etc, condition. An excessive blowby test is quicker and more accurate. The manifolds are above the head gskt area. Usually when there's oil/antifreeze leaking due to head gskts it's at the rear and very slight. It's easily seen by looking up on both sides where the heads meet the block. If you listed your truck in your signature, a more intelligent diagnosis could be made. Like how many miles on the clock, year etc. Valve guides, missing/broken valve seal caps and all the rest listed above..
You have to put that info in your signature. Also add if it's a early or late 94. A late 94 is a Powerstroke computer controlled. An early 94, the turbo was an option. If it's a Powerstoke, you might want to post in the 94 to 97 forum. Oil consumption. It's possible the turbo O'rings are blown. Does it Blue smoke out the exhaust? Maybe be a bit more specific? If you're referring to a cold startup, smoke for about 30 seconds is perfectly normal. To minimize smoke complaints, that's why Ford spec'd the cold fast idle and cold timing advance feature. I wouldn't worry too much about turbo seals, first, they have seals, not O-rings, and second after working on these things for decades, for all the severe duty these critters undergo in regard to heat and spin speed, turbos very seldom give any trouble, bushings or seals. Oil consumption is way more common to be one of the options mentioned above. Last edited by LMJD; 04-13-2016 at 09:48 AM. My Boo Boo, should have said seals. Okay thank you for your feedback I greatly appreciate it!! I think this is probably where it's leaking from so would it be the valve cover gasket? Sure looks like it to me, did you try tightening it up?